The sample is the limited number of measurements that you make. The population is the total number of measurements that you might take. A totally representative sample is everything you need to know about the population. Random sampling is used where the study area is uniform. For example, in a flat, grassy field you can assume that the environmental conditions do not change within the area so it doesn’t matter where within the area you take your samples from. Random sampling should be free from bias, but it is difficult to obtain a representative sample. The number of samples taken is important. Systematic sampling is used when the study area includes an environmental gradient. You would sample along a line and sample points should be evenly spaced or distributed. Systematic sampling is quick and easy to do, but you must be careful not to miss variation. The number of samples that you take (the sampling size) is important. Stratified sampling is used when the study area includes significantly different parts or subsets. In an investigation into the effect of stream ordering on discharge, a stratified sample would be to choose sites where the two river segments of the same order join. Stratified sampling overcomes the problem with missing variation that might arise with systematic sampling. It is, however, difficult to get background data to allow you to apply stratified sampling appropriately. Further readings. An Introduction to Scientific Research Methods in Geography. 2006 Montello. D. R. and Sutton. P. C. Sage. Soil testing is done by taking soil samples from different locations of the soil horizons. The soil samples are then taken to a lab for further analysis of the content of moisture, minerals, organic matter and air in the soil. Figure 1. Soil examined from a scar made by excavator. For further readings and additional activities, check Virtual soil science learning resources and lab (http://soilweb.landfood.ubc.ca/promo/ Soil testing methods. 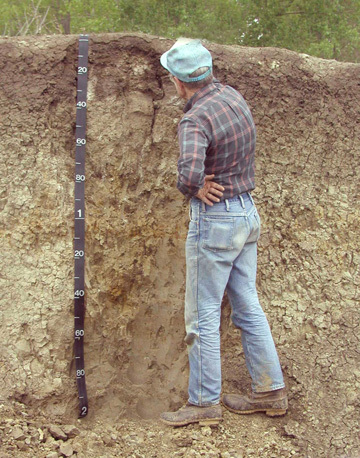 http://soiltest.cfans.umn.edu/our-methods , and Soil sampling and methods of analysis book. http://www.planta.cn/forum/files_planta/methods_of_analysis_212.pdf You can also check out these suggested textbooks; Soil Science And Management. 2008. Plaster. E., Delmar Publishers Inc. and Elements of the Nature and Properties of Soils. 2009. Brady. N. C. and Weil. R. R. Pearson. Hydrology is the study of the movement, distribution and quality of water on Earth and other planets, including the hydrologic cycle, water resources and environmental watershed sustainability. A practitioner of hydrology is a hydrologist, working within the fields of earth or environmental science, physical geography, geology or civil and environmental engineering. Hydrogogy research makes extensive use of modelling to create conceptual representations of the different parts of the hydrologic cycle. For more information on hydrology and the types of models used in hydrology, refer to Hydrology: An Introduction. 2005. Brutsaert. W., Cambridge University Press,Fundamentals of Hydrology. 2008. Davie. T. and Quinn N. Routledge, and Hydrology. 2013. Das M. M. and Saikia M. D. PHI Learning Private Limited. Climatology is the study of climate, scientifically defined as weather conditions averaged over a period of time. Weather monitoring stations collect information for decades about temperature; wind velocity and direction; moisture concentration in the air; and precipitation, and indicate a specific climatic condition at a specific part of Earth. Suggested textbooks and resources for more information on climatology Climatology. 2013. Rohli. R. V. Vega. A. J. Jones & Bartlett Learning, Climatology: An Atmospheric Science. 2009. Hidore. J. J. Oliver. J. E. Snow M. Snow R, the Encyclopedia of world climatology. 2005. Edited by Oliver. J. E. Springer. Statistical techniques and procedures are applied in all fields of academic research; wherever data are collected and summarized or wherever any numerical information is analyzed or research is conducted, statistics are needed for sound analysis and interpretation of results. For additional information about statistics methods in geography, see Statistical Methods for Geography: A Student’s Guide. 2012. Rogerson. P. A. SAGE Publications Ltd. Physical Geography Research Methods by Geography Open Textbook Collective is licensed under a Creative Commons Attribution 4.0 International License, except where otherwise noted.